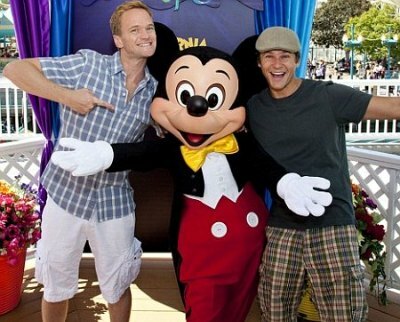 Neil Patrick Harris & David Burtka Having Twins & Going To Disneyland! Neil Patrick Harris and his boyfriend David Burtka are going to be the proud fathers of two new babies come this fall! The actor and his main squeeze have twins on this way via a surrogate mother this October. How sweet is that! E-Online reports that the duo are already planning the baby shower for their impending arrival. There has been previous speculation about their fatherhood plans, but Neil himself quelled that on his official Twitter. The duo were spotted visiting a surrogacy agency in L.A. last year, after having spent the last six years together. How cute is that. I’m sure they’re going to make delightful parents. And to celebrate, the cute couple went to DisneyLand! Adorbz. Any suggestions on what they should name their sweet little bundles of joy? Another Baby For Matt Lauer and His Wife! The First Glimpse of Eddie Murphy’s Baby? Angie Harmon Has A Baby Girl! Nicole Richie Is Preggers Again! Brande Roderick Welcomes Son: Keaton Roderick Cadrez!